The compatible Brother LC61C cyan ink cartridge from InkTonerWeb.com is guaranteed to perform with your Brother DCP-165C, DCP-385C, DCP-395CN, DCP-585CW, DCP-J125, MFC-250C, MFC-255CW, MFC-290C, MFC-295CN, MFC-490CW, MFC-495CW, MFC-5490CN, MFC-5890CN, MFC-5895CW, MFC-6490CW, MFC-6890CDW, MFC-790CW, MFC-795CW, MFC-990CW, MFC-J220, MFC-J265W, MFC-J270W, MFC-J410W, MFC-J415W, MFC-J615W, MFC-J630W printers. 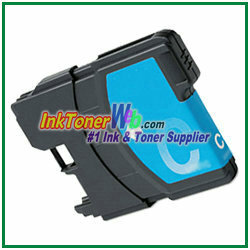 It replaces the original Brother LC61C ink cartridge. Our compatible (generic) replacement LC61C ink cartridge is made in ISO9001 & 14001 factories and meet the highest standards of quality, reliability and exceptional yields, offering high-quality printing results as OEM LC61C ink cartridges.